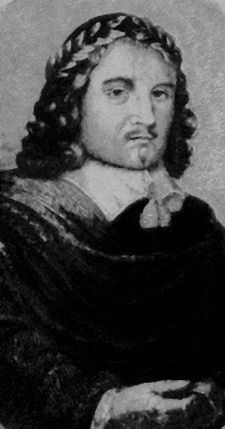 Thomas Middleton (1580 – 1627) was an English Jacobean playwright and poet who is notable for his mastery of English prosody and his deeply cynical and ironic characterizations. Middleton stands with John Fletcher and Ben Jonson as among the most successful and prolific of playwrights of the Jacobean era. T.S. Eliot famously declared that Middleton was second only to William Shakespeare, and like Shakespeare, Middleton is one of the few English dramatists of any era to achieve success in both comedy and tragedy. In addition to this, Middleton was also a prolific writer of masques, pageants, and other occasional dramas, and he remains one of the most noteworthy and characteristic of Jacobean dramatists. Middleton was born in London and baptized on April 18, 1580. He was the son of a bricklayer who had been raised to the status of a gentleman. His father died when Middleton was very young; his mother's remarriage devolved into a lengthy battle over the inheritance of Thomas and his siblings. Little else is known of Middleton's childhood and family. Middleton attended Christ's Hospital and The Queen's College, Oxford, although he did not graduate. During his university years, 1598-1601, he wrote and published three long poems in popular Elizabethan styles; none appears to have been especially successful, but one of the three publications, a lengthy satire, ran afoul of the Anglican Church's ban on verse satire and was publicly burned. Thus, Middleton's literary career was launched. In the early 1600s, Middleton made a living writing topical pamphlets, including one—Penniless Parliament of Threadbare Poets—that enjoyed many reprintings. At the same time, records in the diary of Philip Henslowe show that Middleton was writing for the popular theater company, The Admiral's Men. Unlike Shakespeare, Middleton remained a free agent, able to write for whichever company hired him. This free agency allowed Middleton a great degree of freedom both in the form and content of his plays, and his early dramatic career was consequently marked by controversy. In 1603, Middleton married. The same year, an outbreak of plague forced the closing of the theaters in London, and James I assumed the English throne. These events marked the beginning of Middleton's greatest period as a playwright. Having passed the time during the plague composing prose pamphlets (including a continuation of Thomas Nashe's Pierce Penniless), he returned to drama with great energy, producing a great number of plays for several companies and in several genres, most notably city comedy and revenge tragedy. His own plays from this decade reveal a somewhat mellowed cynicism. As he matured, Middleton moved away from mere satire towards a more deeply introspective and complicated style, and the result are some of the finest masterpieces of English drama in a variety of dramas, including the comic masterpiece Michaelmas Term and the vicious tragedy, The Revenger's Tragedy. Middleton was also branching out into other dramatic endeavors; he was apparently called on to help revise Macbeth and Measure for Measure, and at the same time he was increasingly involved with civic pageants. This last connection was made official when, in 1620, he was appointed City Chronologer of the City of London. He held this post until his death in 1627, at which time it was passed on to Ben Jonson. Middleton's official duties did not interrupt his dramatic writings; the 1620s saw the production of his and Rowley's tragedy The Changeling, and several tragicomedies. In 1624, he reached a pinnacle of notoriety when his dramatic allegory, A Game at Chess was staged by the King's Men. The play used the conceit of a chess game to present and satirize the recent intrigues surrounding the proposed marriage between Prince Charles and a Spanish princess, an event which was, in its time, deeply controversial in Protestant England. Though Middleton's approach was strongly patriotic, the Privy Council shut down the play after nine performances on the complaint of the Spanish ambassador. Middleton faced an unknown, but likely frightening, degree of punishment. Since no play later than A Game at Chess is recorded, it has been hypothesized that his punishment included a ban on writing for the stage. Middleton died at his home in Newington Butts in 1627. Middleton wrote in many genres, including tragedy, history, and city comedy. His best-known plays are the tragedies, The Changeling (written with William Rowley) and Women Beware Women, and the cynically satiric city comedy, A Chaste Maid in Cheapside. Middleton's work is diverse even by the standards of his age. He did not have the kind of official relationship with a particular company that Shakespeare or Fletcher had; instead, he appears to have written on a freelance basis for any number of companies. Particularly in the early years of his career, this freedom led to a great diversity in his output, which ranges from the "snarling" satire of Michaelmas Term to the bleak intrigues of The Revenger's Tragedy. Also contributing to the variety of the works is the scope of Middleton's career. If his early work was informed by the flourishing of satire in the late-Elizabethan period, his maturity was influenced by the ascendancy of Fletcherian tragicomedy. If many of these plays have been judged less compelling than his earlier work, his later work, in which satiric fury is tempered and broadened, also includes three of his acknowledged masterpieces. A Chaste Maid in Cheapside, produced by the Lady Elizabeth's Men, skillfully combines Middleton's typically cutting presentation of London life with an expansive view of the power of love to effect reconciliation. The Changeling, a late tragedy, returns Middleton to an Italianate setting like that in The Revenger's Tragedy; here, however, the central characters are more fully drawn and more compelling as individuals. Similar changes may be seen in Women Beware Women. Middleton's plays are characterized by their cynicism about the human race, a cynicism that is often very funny. True heroes are a rarity in Middleton; in his plays, almost every character is selfish, greedy, and self-absorbed. This quality is best observed in the A Chaste Maid in Cheapside, a panoramic view of a London populated entirely by sinners, in which no social rank goes unsatirized. It can also be seen in the tragedies, Women Beware Women and The Revenger's Tragedy, in which enjoyably amoral Italian courtiers endlessly plot against each other, resulting in a climactic bloodbath. When Middleton does portray good people, the characters have very small roles and are flawless to perfection. Thanks to a theological pamphlet attributed to him, Middleton is thought by some to have been a strong believer in Calvinism, among the dominant strains in the theology of the English church of his time, which rigidly divides humanity into the damned and the elect, and which focuses on human sinfulness, lust, and inadequacy as the central fact of temporal life. In comedy, Middleton generally follows classical models at some remove. His early hit, A Trick to Catch the Old One, is essentially Plautus brought into the seventeenth century. In his comedies, Middleton generally retains a romantic entanglement as a basic structural element; he did not experiment, as Jonson did, with comedic form. His main interest, however, is in social and psychological satire. This interest makes him akin not only to Jonson but also to the other dramatic satirists of his day, such as Marston. His tragedies are squarely in the Senecan tradition of the Jacobean theater. They are generally concerned with courtly revenge, and even when they are not, the central narrative element is scheming and counter-scheming, motivated by lust or greed, eventuating always in a bloodbath. A Yorkshire Tragedy is a partial exception in that it is a domestic tragedy; even here, however, the key to the tragedy is the cruelty and lust of the abusive husband. Middleton's tragicomedies follow the model set by Fletcher in broad outline: They feature remote settings, unusual and even bizarre situations, and last-minute rescues from seemingly tragic inevitability. Note: The Middleton canon is beset by complications involving collaboration and debated authorship. The following list is based on that provided by the Oxford Middleton Project, a team of scholars who are editing a new edition of Middleton's complete works. All dates of plays are dates of composition, not of publication. The Bloody Banquet (1608-9); co-written with Thomas Dekker. The Roaring Girl, a city comedy depicting the exploits of Mary Frith (1611); co-written with Thomas Dekker. The Second Maiden's Tragedy, a tragedy (1611); an anonymous manuscript; stylistic analysis indicates Middleton's authorship. Macbeth, a tragedy. Various evidence indicates that the extant text of William Shakespeare. Shakespeare's Macbeth was partly adapted by Middleton in 1616, using passages from The Witch. A Fair Quarrel, a tragicomedy (1616). Co-written with William Rowley. The Old Law, a tragicomedy (1618-19). Co-written with William Rowleyand perhaps a third collaborator, who may have been Philip Massinger or Thomas Heywood. Measure for Measure. Stylistic evidence indicates that the extant text of Shakespeare's Measure for Measure was partly adapted by Middleton in 1621. Anything for a Quiet Life, a city comedy (1621). Co-written with John Webster. The Changeling, a tragedy (1622). Co-written with William Rowley. The Spanish Gypsy, a tragicomedy (1623). A Game at Chess, a political satire (1624). Satirized the negotiations over the proposed marriage of Prince Charles, son of James I of England, with the Spanish princess. Closed after nine performances. The Whole Royal and Magnificent Entertainment Given to King James Through the City of London (1603-4). Co-written with Thomas Dekker, Stephen Harrison and Ben Jonson. The World Tossed at Tennis (1620). Co-written with William Rowley. The Meeting of Gallants at an Ordinary (1604). Co-written with Thomas Dekker. Sir Robert Sherley his Entertainment in Cracovia (1609) (translation). The Two Gates of Salvation (1609), or The Marriage of the Old and New Testament. ↑ Dorothy M. Farr, Thomas Middleton and the Drama of Realism (New York: Harper and Row, 1973). Baines, Barbara Jo. The Lust Motif in the Plays of Thomas Middleton. Salzburg, 1973. Eccles, Mark. "Middleton's Birth and Education." Review of English Studies 7 (1933), 431-41. Frassinelli, Pier Paolo. "Realism, Desire, and Reification: Thomas Middleton's A Chaste Maid in Cheapside." Early Modern Literary Studies 8 (2003). Schoenbaum, Samuel. "Middleton's Tragicomedies." Modern Philology 54 (1956), 7-19. Wells, Stanley. Select Bibliographical Guides: English Drama, Excluding Shakespeare. Oxford: Oxford University Press, 1975. All links retrieved October 27, 2014. The Cambridge History of English and American Literature in 18 Volumes (1907–21). Volume VI. Cambridge: Cambridge University Press, 1907-21. No ISBN.Bartleby e-text. The Plays of Thomas Middleton. This page was last modified on 27 October 2014, at 15:21.